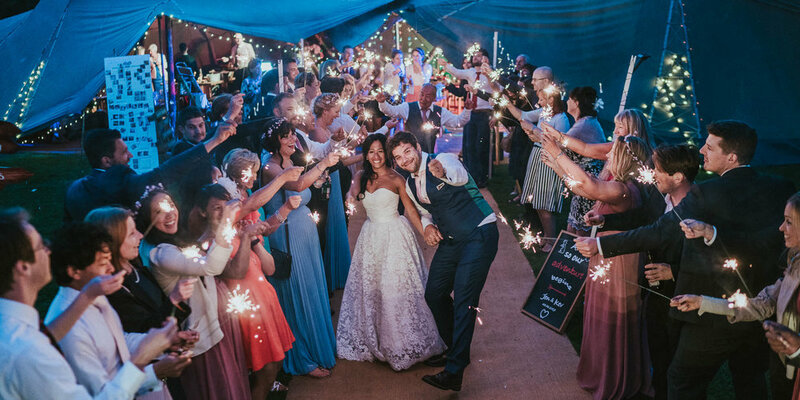 Jen & Kev's wedding was back in June last year at the beautiful victorian Oldberrow House in Warwickshire, and what an awesome day it was! Pretty much every part of the day took place outside, so luckily it was a hot, sunny, summers day. The bride and groom both got ready in Oldberrow House, in opposite rooms. Lots of careful door control to make sure neither saw each other before the ceremony! They had a relaxed humanist ceremony, which took place in the grounds surrounded by trees underneath a handmade wooden and floral arch. Jen and Kev, and their guests enjoyed tons of lawn games, and plenty of drinks & canapés before the wedding breakfast in the tipi, decorated with one thousand origami cranes. Instructions were left on the tables for people to be able to make their own too. Fierce battles were held across the beer pong table and the gladiator duelling posts which made for some awesome pictures. After dinner and the speeches a photo booth was set up in a vintage VW campervan. Jen & Kev, and myself headed off for a few pictures in the nearby fields. We took some smoke bombs with us too, for some of the photos! As soon as we got back from the couple shoot the evening celebrations begun with a dramatic first dance underneath the origami cranes in the tipi. Just after sunset, we all headed back outside for some sparklers in the twilight, which was my cue to head off. Thanks so much to Jen & Kev for inviting me along to photograph their fun filled wedding day. Hope you all enjoy the pictures!